PURIM LIVE 2015! Chanukah at Zablozki's Sukkot & Simchat Torah 2013 Simchat Torah Celebration 5771- 2010 Lag B'omer BBQ & Drum Circle in McCarren Park Yom Kippur 5769 (2008) Shofar Factory 2010 Simchat Torah 5771- 2010 Where in The World is Chabad Dancing?! Rock'n Kids Chanukah Party! Chanukah on Ice 2014 Lag B'omer Family Fun Fest in McCarren Park- 2015! Shavuot Ice Cream Party! Havdalah Pajama Party Untitled Kids Chanukah Party 2015 Sushi in the Sukkah Chanukah at the Gutter Chanukah Friday Night Dinner PURIM BASH! 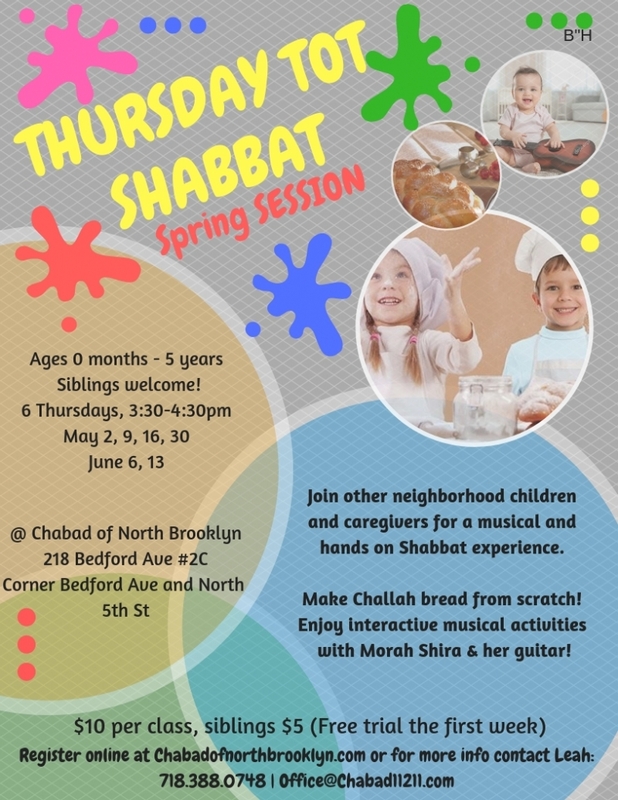 Join other local tots and caregivers for a Pre- Shabbat Experience! Class size is limited and will be filled on a first come first serve basis. Children must be registered in advance. Strollers should be brought up to second floor, to hallway outside of Chabad.